Finding phyllo dough recipes can provide you with a wide array of options to create delicious gourmet food. Using phyllo pastry and a variety of fillings, you can create diverse appetizers, main courses, casseroles and desserts. Phyllo pastry is a Mediterranean pastry that comes in paper thin sheets. When you layer the sheets together, brush each layer with butter and bake them, the result is a flaky pastry. You can make your own phyllo pastry or find it in the freezer section of your grocery store. When you work with phyllo dough, keep it under a damp towel in order to prevent drying. Brush each sheet with melted butter before layering on another. While phyllo dough is sold in most grocery stores, you can make your own as well. Be sure to leave yourself plenty of time; phyllo dough is the most pliable when it has been allowed to sit undisturbed for a minimum of two hours. Place the flour, oil and eggs in a mixer and turn it on low. Add the water slowly, allowing it to become well incorporated. Mix until the dough is moistened and has just begun to smooth out; it will start very rough and grainy. Remove the dough from the mixer and knead by hand on a floured counter until the dough is very smooth and pliable. Cover the dough in plastic wrap and let stand for at least to two hours at room temperature. Divide the dough into sections the size of baseballs and place one at a time on a floured surface to roll. Roll the dough out to approximately 1/8 inch thick. Use your hands to stretch the dough further until it is nearly transparent. Transfer each sheet to a damp paper towel and cover with butter until needed. You can use phyllo dough to make traditional recipes such as baklava and spanakopita, or you can substitute it for puff pastry in recipes such as apple strudel or beef wellington. Baklava is a traditional phyllo recipe that combines nuts, flaky pastry, spices, and sweet honey to make a delicious dessert. Using a food processor, pulse nuts, spices and sugars together until the nuts are finely chopped. Brush a 9 x 13 pan with melted butter, and alternate layers of butter and phyllo until you have ten layers. Spread the nut mixture on top of the layered phyllo. Top the nut mixture with another ten layers of phyllo dough and butter. 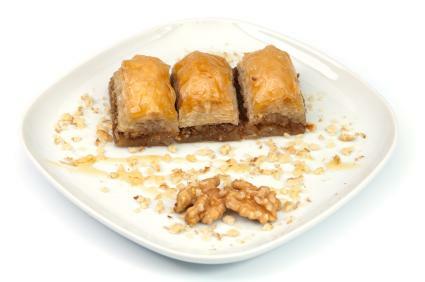 Cut the baklava into diamond or triangle shapes and bake for one hour, until the pastry is golden brown. Top with cooled honey syrup, below. Phyllo dough pastry makes a delicious and flaky apple strudel. Brush a cookie sheet with butter. Combine apples, one cup of the sugar, cinnamon and lemon zest in a bowl. Use half of the apple mixture, spreading it over the layers of phyllo leaving a two inch border on each side. Fold the edges over the filling and then roll the pastry. Place on the cookie sheet and brush it with butter. Repeat steps one through six with the remaining phyllo and filling. Bake for 45 minutes, until dough is golden brown. Try this delicious, Greek spinach pie. Grease a 9 x 9 square pan. Sauté onions, scallions and garlic in three tablespoons of olive oil until lightly browned. Stir in the spinach and sauté until the spinach wilts. While the spinach mixture cools, mix together parsley, eggs, ricotta and feta until well-combined. Mix in the cooled spinach mixture. Layer four layers of phyllo dough in the pan, brushing each sheet with olive oil. Cover with the spinach mixture. Layer the remaining four sheets of phyllo on top of the spinach, brushing each layer with olive oil. Fold edges of pastry that overhang the pan's edges inside of the pan. Bake for 30 to 40 minutes, until the pastry is golden brown. Serve warm. These are just a few of the many phyllo dough recipes you can try. Whether you are making something sweet or savory, phyllo dough makes an easy yet flaky pastry.